Essential Question: How does what we have read or experienced in the past influence us as we read something new? – Summative: Students will create biographies in the form of newspaper articles, comics, etc. Objective: Students will understand the culture of reading and writing during late 18th-/early 19th-century England. Standard: CCSS.ELA-Literacy.RI.11-12.7 Integrate and evaluate multiple sources of information presented in different media or formats (e.g., visually, quantitatively) as well as in words in order to address a question or solve a problem. Rationale: In order to understand who Jane Austen the author and reader really was, and how she operated in the context of her society, students must be able to construct a biography of Austen based on multiple source materials, both primary and secondary. The romanticized version of Austen will be explored and deconstructed so that students may develop an understanding of who Austen really was before reading our primary text Northanger Abbey. Students will evaluate primary source materials from the late 18th/early 19th centuries in order to construct a historical perspective of Georgian England. Students will engage in an exploration of who Jane Austen was by looking at several different primary and secondary sources. The teacher will explain that students’ ideas about Austen will be confirmed or denied by the three sources they are about to look at. 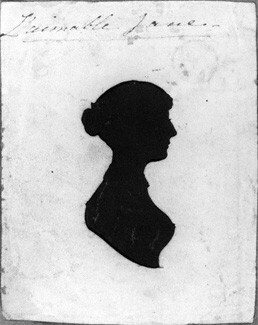 Next, students will go to northangerclassroom.org and look at several readings that will help students gain an understanding of who Jane Austen was. The “Biographical Notice of the Author” by Henry Austen (located under the Student Resources tab on the “Who is Jane Austen?” page) will be the first primary source for students to review. The teacher will explain that the “Notice” was written by Austen’s brother who was a reverend. The teacher may read aloud the excerpt, have students read in groups, or have students read independently. Students should note key phrases or descriptions that Henry Austen uses to depict his sister. After the reading, the class should discuss the over-all impression that they received after reading the “Notice” and how their new knowledge affects their previous ideas of Austen. Finally, students will look at the chronology of Jane Austen’s life, also located under the “Who is Jane Austen?” Student Resources tab . The teacher should stress that this final source is the only compilation of facts that the class has looked at so far. 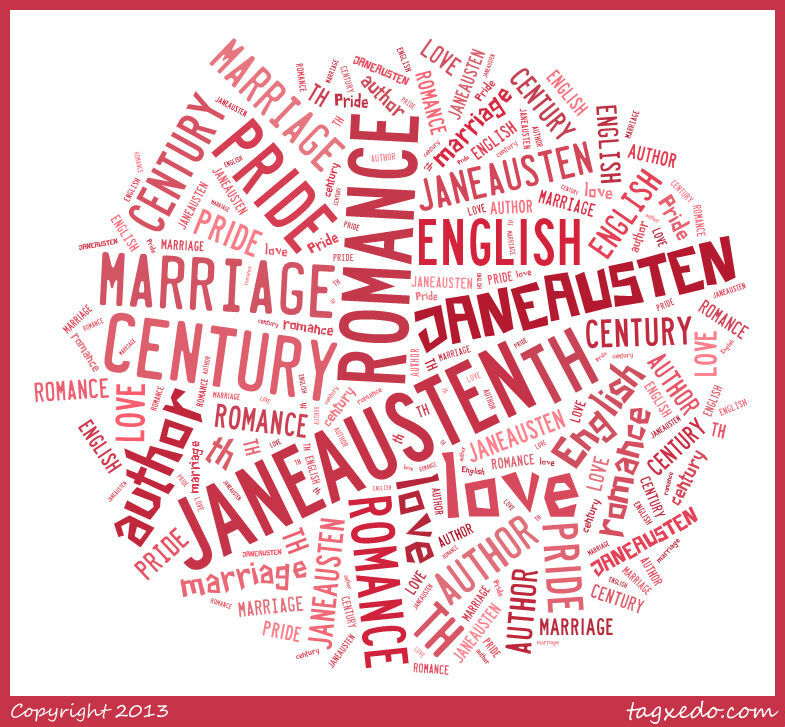 Students may use the Who is Jane Austen Graphic Organizer in order to compare and analyze the different sources that they will be looking at in this lesson. 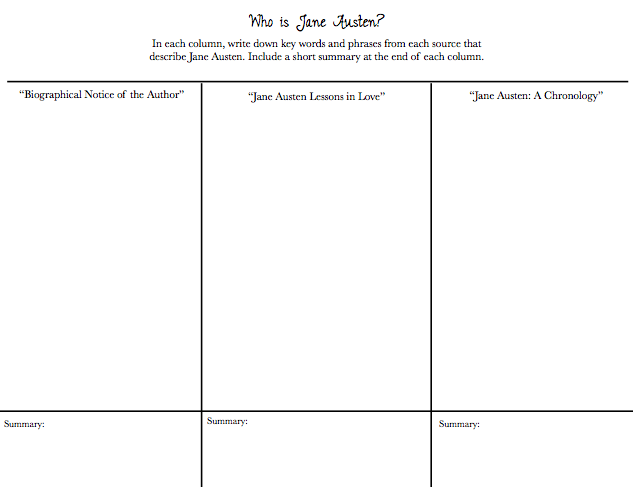 The graphic organizer contains columns for each source, with a space for students to write a short summary of their impressions, and how the source depicted Austen. Students may use this sheet while looking at the sources above, or afterwards as a reflection activity. Why are there such different portrayals of Austen? How do the facts measure up to the opinions of others that we have seen? What do we really know about Jane Austen? After having the opportunity to discuss these differences, students will create a newspaper article, interview, comic, or obituary that demonstrates their understanding of Austen. This can be done for homework or during class-time. Student work may then be compiled into a book, or displayed in the classroom so that students may view each others’ opinions and accomplishments. After constructing an understanding of how Jane Austen is portrayed in media versus what we really know, students will place Austen as a reader and writer in the context of her society and other works. Students will read “Jane Austen and literary traditions” from the Cambridge Companion to Jane Austen to gain an understanding of how the culture of reading and writing influenced Austen and her works. After reading the chapter, students will compose a brief written response that answers the question: “How did reading and literature influence Jane Austen and her writing?” Students may break into small groups to share their findings with one another. Next, students will read Chapter I from Volume III of The Mysteries of Udolpho by Ann Radcliffe (located under the Student Resources tab). The teacher will explain that this was a very popular Gothic novel published in 1794, and plays a significant role in Northanger Abbey. This scene in particular will contribute to the class’s reading of Austen’s novel. The teacher will pass out the Gothic Literature Fact Sheet to help students gain an understanding of Gothic literature and the common tropes that appear. After reviewing the fact sheet, the teacher will ask students to look for elements of the Gothic in the chapter from The Mysteries of Udolpho. The teacher may read aloud the chapter, or have students read on their own. To demonstrate their understanding of Gothic themes and tropes, students may collaboratively construct a short-story using Google Drive. Using this interface, students may break into small groups, or as a whole class, construct a Gothic narrative using the themes outlined on the Gothic Literature Fact Sheet. This interface works well for collaborative pieces, as the teacher can see who contributed what to each document, and students can work on their assignment away from school.